There’s a whole load of mystical fairies at the bottom of the enchanted garden who are just waiting to adorn you with gifts that range from beautiful cash prizes to free spin, scatter and Wild bonuses. 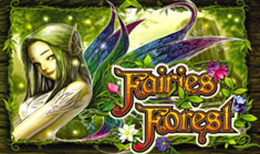 Join the fairies on a quest of awe and wonder and spin the reels to match colourful forest birds, vined letters and lotus leafs in this beautifully animated online slot game. NextGen prides itself on being an experienced developer of successful slot games for online and land-based markets internationally. Not only this, but they have attained their own motto: Attract, Entertain, and Retain. This has enabled them to develop their growing community of slot games with this attitude. Furthermore, with 18 years of experience and a strong and established reputation, it is without surprise that they have had so much success as they have had with their creations. With one of their magical creations, Fairies Forest, NextGen have gone truly gone beyond to provide you with the closest atmosphere of a forest as you can get. The forest and earthly greens used to get you into this idyllic atmosphere are accompanied with gaping vines, reminiscent of a monkey’s playground, and an abundance of flowers. The symbols that are visible on this 5-reel, 25 payline slot-game, are also a reminder of what you can expect to find a fantastical forest. These symbols include: a pink flower, purple mushrooms, a crystal ball, and a colourful bird. If you locate 5 of either the pink flower or the purple mushroom anywhere on the reels, the fairies will pay you 500 times your initial bet. The fairies will award you handsomely with 1000 times your stake if you gather 5 vials of fairy dust. As an even better bonus, finding 5 colourful birds will return you with 5000 times your stake. The minimum bet starts at just 1p too, with a max of £2 so even just betting 1p returns £50 with the collection of 5 of those vibrantly coloured birds. This enchanting slot-game is practically giving money away! The wild card to keep your eyes peeled for is the green haired fairy. She appears on reels 2, 3 and 4 and she can expand to all positions on that reel if a winning combination is possible. So, not only will they reward you divinely with the objects you salvage for them, but they are also willing to help you out by increasing your chances of winning. The scatter symbol in this slot-game is the sparkly view of the magic forest reflected in a lake and 3 or more of these symbols collected will result in 10 free spins. However, during these free games, there will be no extra multiplier but the expanded fairy will be active here. This means that during the free spins, each time the fairy lands and expands any wins to which she contributes, a multiplier of x3 will be added. The game also offers a gambling feature where you can guess either the colour or suit of the next card drawn to double or quadruple your win. It is simple a bonus game of chance rather than skill, so it is worth a punt, but get one wrong and you lose it all! This wonderful woodland slot-game is perfect for those who do not want to spend a whole afternoon trying to accumulate a small fortune. With this fun-filled game, with bright, vibrant images, and bets starting from just a penny, there really is every reason to give this mystical slot-game a go today!